Fleabane is a member of the Sunflower Family. It grows to 16 inches in height and has grayish green, hairy leaves. The plant typically grows in woodlands and clearings at elevations between 4500-9500 feet. 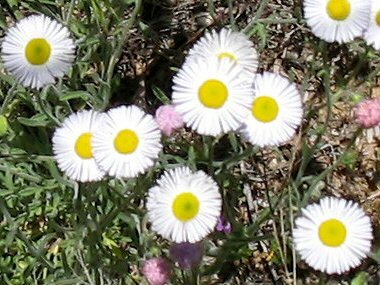 There are more than two dozen Fleabane species in Arizona, they are difficult to distinguish from each other. Fleabane typically blooms between May - October and produces daisy-like white to pale lavender flowers to 1 inch in width with a prominent yellow disk.